William Caesar Warfield was one of the greatest baritones of the twentieth century, the best-known singer of George Gershwin’s Porgy and Bess. Born in 1920 to sharecroppers in West Helena, Arkansas, Warfield grew up in Rochester, New York, where his father moved the family seeking better opportunity. Warfield’s father became the minister at Rochester’s Mount Vernon Baptist Church, where William and his four brothers sang in the choir. At age sixteen, Warfield first sang what would become his signature song, Jerome Kern’s “Ol’ Man River,” from the musical Showboat. Recognizing his talent, his high school music teacher entered him in the national Music Educators League Competition. Warfield won the prize, a scholarship to the college of his choice. He chose Rochester’s Eastman School of Music, preparing for a career as a music teacher. Warfield graduated from Eastman during World War II and entered the military. His familiarity with German, learned from singing classical music in that language, resulted in his four year assignment to the Intelligence unit. After the war, he returned to Eastman to study for a master’s degree. 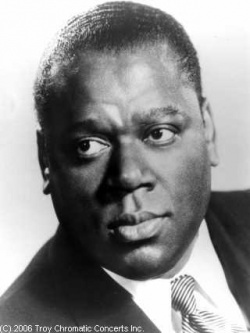 During this time two great black singers of the day – Paul Robeson and Marian Anderson – heard Warfield perform and urged him to pursue a professional singing career. He landed roles in the touring companies of Call Me Mister, Set My People Free, and the opera Regina. Warfield performed in churches and synagogues and developed a nightclub act, singing and playing the piano. A Canadian stockbroker who heard Warfield in a Toronto nightclub gave him the financial backing for a New York recital at Town Hall in 1950. His acclaimed performance there of classical music and spirituals set him on a path to international stardom and landed him the role of Joe the stevedore in the 1951 film Showboat, based on the successful Broadway musical. In 1952 the State Department sponsored a ten-week European tour of Porgy and Bess, starring Warfield as Porgy and Leontyne Price as Bess. The two married that year and divorced in 1974. Over the years, Warfield gave countless classical concerts, performing Bach, Mendelssohn, Mozart, Verdi, Brahms and Aaron Copeland – one of his favorite composers. He taught at the University of Illinois in Champaign-Urbana from 1974 to 1990 and joined the faculty of Northwestern University in Evanston, Illinois, in 1994. He died in Chicago from complications from a fall in 2002.